Stratego was created by Mogendorff during World War II. It registered as a trademark in 1942 by the Dutch company Van Perlestein & Roeper Bosch NV. In 1958 the license was granted to Hausemann an Hotte. 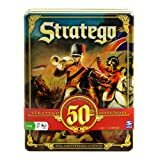 The first version of Stratego was distributed by Smeets and Schippers in 1946 (United States Court, 2005). In 1961 the game was sublicensed to Milton Bradley, which was acquired by Hasbro in 1984, and first published in 1961 in the United States. The origins of Stratego can be traced back to traditional Chinese board game Jungle also known as "Game of the Fighting Animals" (Dou Shou Qi) or "Animal Chess". The game Jungle also has pieces (but of animals rather than soldiers) with different ranks and pieces with higher rank capture the pieces with lower rank. The board, with two lakes in the middle, is also remarkably similar to that in Stratego. The major differences between the two games is that in Jungle, the pieces are not hidden from the opponent, and the initial setup is fixed. A modern, more elaborate, Chinese game known as Land Battle Chess (Lu Zhan Qi) or Army Chess (Lu Zhan Jun Qi) is a descendant of Jungle, and a cousin of Stratego: the initial setup is not fixed, both players keep their pieces hidden from their opponent, and the objective is to capture the enemy's flag. Lu Zhan Jun Qi's basic gameplay is similar, though differences include "missile" pieces and a Chinese Chess-style board layout with the addition of railroads and defensive "camps". A third player is also typically used as a neutral referee to decide battles between pieces without revealing their identities. An expanded version of the Land Battle Chess game also exists, adding naval and aircraft pieces and is known as Sea-Land-Air Battle Chess (Hai Lu Kong Zhan Qi). 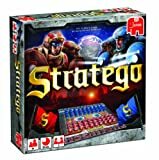 In its present form Stratego appeared in Europe before World War I as a game called L'attaque. Thierry Depaulis writes on "Ed's Stratego Site": It was in fact designed by a lady, Mademoiselle Hermance Edan, who filed a patent for a 'jeu de bataille avec pièces mobiles sur damier' (a battle game with mobile pieces on a gameboard) on 11-26-1908. The patent was released by the French Patent Office in 1909 (patent #396.795 ). Hermance Edan had given no name to her game but a French manufacturer named "Au Jeu Retrouvé" was selling the game as L'Attaque as early as 1910. L'attaque game is played with 36 pieces each on a 9x10 square board. Each piece has a numeric value, which is hidden from the opponent and only revealed when an attacking piece moves onto a square occupied by an opponent's piece. In most cases, the piece with the highest value wins and the losing piece is removed from the board. Play continues until one player finds the opponent's flag piece and takes it. 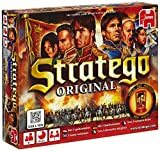 The modern game of Stratego, with its Napoleonic imagery, was originally manufactured in the Netherlands by Jumbo, and was licensed by the Milton Bradley Company for American distribution, and introduced in the United States in 1961 (although it was trademarked in 1960). Pieces were originally made of printed cardboard. After World War II, painted wood pieces became standard, but starting in the late 1960s all versions had plastic pieces. The change from wood to plastic was made for economical reasons, as was the case with many products during that period, but with Stratego the change also served a structural function: Unlike the wooden pieces, the plastic pieces were designed with a small base. The wooden pieces had none, often resulting in pieces tipping over. This, of course, was disastrous for that player, since it often immediately revealed the piece's rank, as well as unleashing a literal domino effect by having a falling piece knock over other pieces. European versions introduced cylindrical castle-shaped pieces that proved to be popular. American variants later introduced new rectangular pieces with a more stable base and colorful stickers, not images directly imprinted on the plastic.